Remember that Willy Nelson tune, On the Road Again? Until recently, I never thought I’d associate driving down the highway like “a band of gypsies” with the smallest car in the nation. Because, you know, smarts are known for being good cars—in the city. Mercedes-Benz (the smart’s manufacturer) has just unveiled a new generation of its little car. Even though it’s manlier than it used to be, the new smart—with a lowercase “s”—is actually the same size as the old one, except that it’s 10 centimetres wider. But the essential smart characteristics are still there, including the short front treatment, two-section hatch that opens right behind the passengers’ backs, plastic body panels and wheels located at the vehicle’s farthest extremities. Inside, it’s a smart through and through but, in my humble opinion, the presentation is now more nicely executed. While the quality of the plastics is still questionable, there are more storage compartments and the bigger rev counter is easier to read. The massive air vents on top of the dashboard add an eccentric touch, but isn’t that why we like the smart? The steering column isn’t depth-adjustable, nor is it height-adjustable. And yet, it didn’t take us long to find the right driving position (but we tested the passion and prime versions, which come with height-adjustable driver seats. In the base trim, it only slides forward and back). There’s no engine under the front hood! As in the past, several components are housed up front, like the battery and the windshield washer fluid and antifreeze tanks. The tiny plastic hood is removable, but it’s easy to snap back into place using two little latches hidden in the front grille—and it’s secured to the vehicle body with two strips of fabric (hello, MacGyver!). The standard grille is black, but for a small price, some versions can be equipped with a silver or white grille. The same goes for the tridion safety cell (which surrounds the body and makes up the better part of the chassis) and its contrasting colour strip that frames the rear of the car. Hey, while we’re on the subject of the safety cell, did you know that it’s built by Magna, a Canadian company? They make it at a French plant located near Hambach, where the smart is assembled. A stretched version of the platform equips the Renault Twingo (a five-door whose wheelbase is 2,492 mm compared to the smart’s 1,873 mm). More ponies than decibels—at last! As with all smarts, the engine is located under the trunk floor. The three-cylinder turbo comes with direct injection and 0.9 litres of displacement (898 cc, to be exact). It produces 89 horsepower at 5,500 rpm and 100 lbs.-ft. of torque at 2,500 rpm. See all the technical specs here. For the first time in the Americas, it’s mated to a five-speed manual transmission, though you can opt for a six-speed dual-clutch automatic. The smart may not be very powerful, but since it only weighs 900 kilos when equipped with the manual gearbox, it performs quite well. But beyond performance, we were impressed by how quiet the engine is. Anyone who has driven the first gen with its horribly loud diesel engine will find this hard to believe, I know! The transmissions were also impressive. The manual is pleasant enough, even though the shifting distance is a touch too long and the clutch isn’t as firm as one would hope. Plus, a lot of people will be glad to know there’s a mechanism to prevent you from rolling back on downhills. The old smart was often criticized for its horrendous automated manual transmission which took ages to shift. Those days are gone. The dual-clutch automatic is transparent and shifts in a snap—and always at the right moment. That said, one of my colleagues complained that it was sometimes abrupt in city conditions, but I didn’t have that problem. On the highway, the smart is much more stable than it once was, thanks in large part to its added width. When you push the laws of physics too far, the car tends to understeer (the front end keeps going straight), but it doesn’t take long before the assistance systems (which you can’t deactivate) intervene with authority. Good news: all trims come with Crosswind Assist, which applies the brakes to make the car more stable whenever it’s struck by crosswinds. No more worries about the smart getting tossed around by a slight breeze! 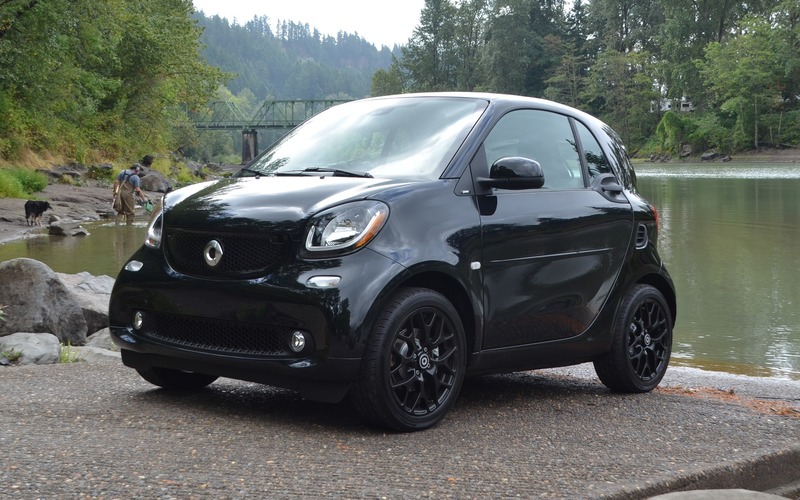 Even though the new smart has proven its chops on the highway, it remains a city slicker. And there’s nothing like a U-turn to prove it. This baby doesn’t turn on a dime, it turns on a pin head! I found myself pulling U-eys just for the fun of it! Depending on which version you choose, you can always add the Touch Screen ($1,395), Sport ($800) or Style ($1,200) packages or some of the pricey options. Note that a cabriolet version is on its way, but the European forfour version isn’t Canada-bound. Also, keep in mind that dealers are currently liquidating stocks of the old-gen electric version. At the end of the day, the smart is one of those vehicles you buy out of love. And the way things are looking now, this love story could last quite a long time. Especially if you just can’t wait to get on the road again. 8/10	We averaged 7.2 L/100 km, but that’s not a good indication since we drove it with wild abandon. 6.0 L/100 km is probably more likely. 7/10	Given its short wheelbase, you can’t expect the smart to be as comfortable as a Lexus. But it’s much better than it used to be. 7/10	Decent for its intended use. 6/10	German automakers tend to make excessively complicated infotainment systems, but this one is about average. 8/10	I never would have believed that I’d give a smart 4 out of 5 for handling. 8/10	The smart may not be for everyone, but it’s no longer a laughingstock.